Constraints on fiscal resources often encourage administrators to seek innovative solutions to increase funding to cover the growing cost of operations and programs. Local law enforcement agencies may have found that asset seizure laws effectively supplement their regular budget allotments. The scope and frequency of criminal and civil seizures has increased since 1970. Evidence suggests these seizures act as an alternative source of funding, supplementing law enforcement budgets and supplanting funds normally provided by legislative bodies. Government property seizures in the U.S. have occurred since the founding of the nation. However, according to research by Levesque and Rogin, the modern era of asset seizure practices is tied to Congress’ passage of the Comprehensive Drug Control Act of 1970 as part of the government’s “War on Drugs.” Under the Act, courts initially allowed seizures on the grounds of probable cause by officers and placed the burden of securing the return of assets on the owner. The federal framework for asset seizure has been modified throughout the years through additional laws and subsequent judicial decisions. 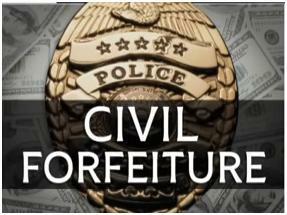 The most significant reform was the passage of the Civil Asset Forfeiture Reform Act of 2000. This act included provisions intended to protect the innocent owner from having assets seized. However, critics argue the protections did not go far enough. In addition to federal laws, states have adopted their own asset seizure regulations. Many of these focus on civil asset forfeiture, making it easier to seize assets. Some states allow the agency to keep all the assets seized. Take Georgia for example. Before 2015, Georgia’s law allowed civil seizure based on probable cause with all assets seized kept by the law enforcement agency. The burden of refuting the accusation and seizure rested on the owner. In 2015, the Governor signed a new law that increased transparency in asset seizure practices and modified the burden for seizure from probable cause to preponderance of the evidence. The new law did not modify the owner’s burden for securing return of seized property. Montana has also modified its seizure laws. The Montana law now requires actual conviction for a civil asset seizure to be considered permanent. This change has increased the difficulty of using civil asset seizure in Montana. According to a 2007 survey report issued by the Bureau of Justice Statistics, 33 percent of state and local law enforcement agencies responding reported collecting $307 million through drug asset forfeitures. A 2004 report published by the National Bureau of Economic Research (NBER) indicated that up to seven percent of a county’s law enforcement budget may be made up of funds seized either under federal or state programs. The NBER report supports the premise that seizures act to offset local government allocations to law enforcement. The authors noted that county law enforcement agencies receiving seized funds under federal programs had budgets offset dollar for dollar from county allocations, while those receiving seized funds through state programs experienced budget allocation offsets of 25 to 40 cents per dollar. The NBER report authors concluded that seizures incentivized law enforcement to increase seizures and legislative bodies to supplant funding to them. Law enforcement appears to have adapted to an environment of limited resources by using an enforcement mechanism as an innovative but controversial budget tool. Federal and state laws allow law enforcement agencies to conduct asset seizures and keep some or all of the proceeds to use at their own discretion. At the same time, asset seizures provide legislative bodies incentive to offset general tax allocations to law enforcement. Regardless of the debate surrounding asset seizures, or the fact that DOJ recently suspended splitting proceeds with local governments, civil asset seizures may be interpreted as a response to tougher economic times faced by law enforcement agencies. The practice represents the darker side of innovation, but does shed light on how organizations find ways to adapt to their fiscal realities.